06 Nov Are Cryptos Gold 2.0? Cryptocurrencies have become worldwide phenomena and Bitcoin became a household word in the years 2017-8. Although the cryptocurrencies market has suffered a huge decline in value, many people still look at Bitcoin as a future currency and store of value. Bitcoin is referred to by many as “digital gold” and the question “will bitcoin replace gold?” generates no fewer than 5,610,000 results on Google; “Bitcoin is the new gold” generates an astonishing 189 million results. 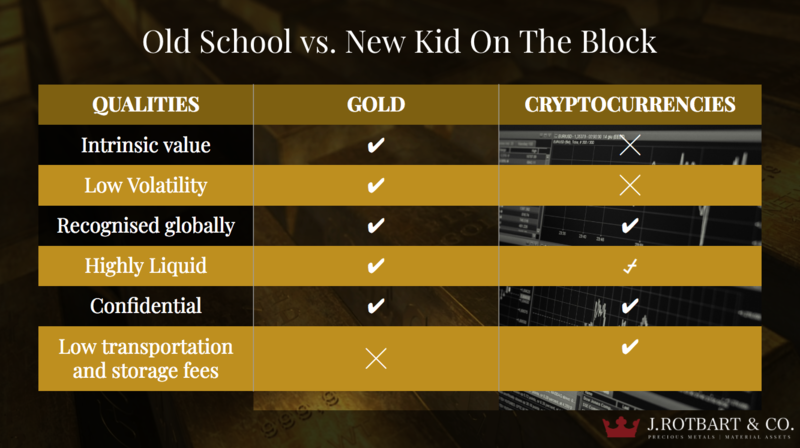 We want to address the question many people are asking: “Are cryptocurrencies Gold 2.0?” from an investment point of view. Should investors buy gold or bitcoin? Can cryptocurrencies replace precious metals as a safe investment or not? What is a better purchase from a wealth protection angle? Joshua Rotbart, Managing Director of J. Rotbart & Co., spoke at the Digital Markets & Gold Symposium in Perth in October 2018 and shared his insights on the topic. Please see Joshua’s presentation for more information. Although there are 2,000 different so called cryptocurrencies in the market today , Bitcoin is still very dominant and controls more than 51.5% of the total crypto market, and therefore we mostly refer to this currency. The connection between cryptocurrencies and gold fascinates many. The question “will bitcoin replace gold?” generates not less than 6,630,000 results on Google. The term “Bitcoin is the new gold” generates 117 million results.